This is the dump in all it's glory. 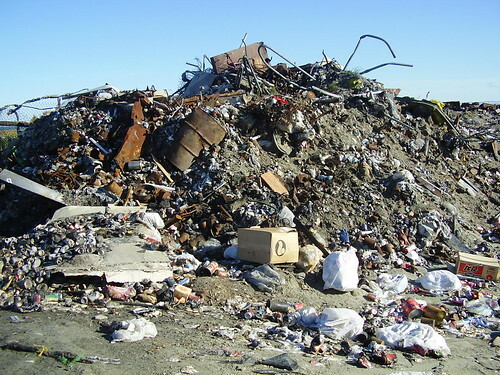 Actually, this is only a very small fraction of the dump. Imagine this picture multiplied by about sixty and surrounding you. Yeah, it's pretty gross. I am glad it is always cold around here, or the smell would knock out small animals and children. 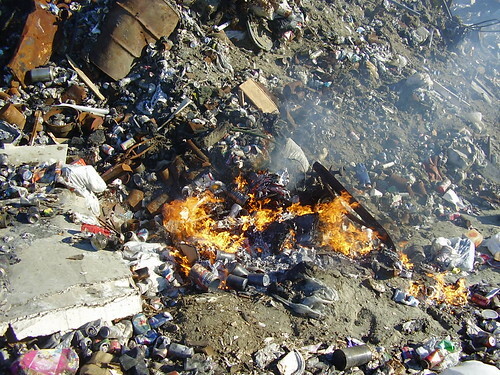 If you are polite, after you dump your trash, you light it on fire. 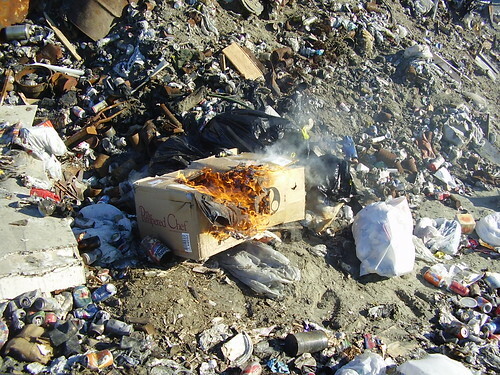 This is a picture of me doing my best to exercise good dump etiquette by lighting our box o' garbage on fire. What this picture doesn't show is the strong wind that was blowing, making extremely difficult to light a match for more that .5 seconds. (Apparently Steve had a lot of experiences lighting matches in his childhood. I, however, was raised in a home where playing with fire was bad.) The Alaska Teacher can't exactly remember if I got the fire started or not. The Alaska Teacher consulted Steve, but he only shrugged. 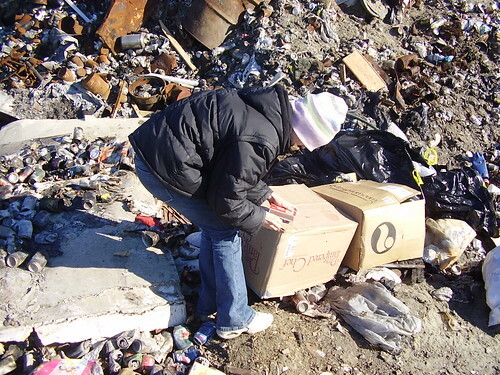 The task may have been turned over to a more able member of the dump expedition. Once the garbage catches on fire, you wait long enough to determine that the rubbish will in fact burn and not blow out after a measly thirty seconds. If you are really lucky, you will find a fire that somebody else started, and you can just toss on your trash and go. We stayed long enough this first time to watch our garbage burn almost completely (the novelty of that wore off real fast). As evidenced by the massive piles of trash behind our small pile of ashes, not everybody makes an effort to burn their trash, which is rude. In their defense, trash like empty pop cans (produced by the thousands in Shishmaref) doesn't burn very well. Also, it can sometimes be hard to start fires in the snow. The Alaska Teacher refuses to judge those who drop and dash without burning. Steve and I (but mostly Steve) look forward to the day when somebody else will haul our trash away for us. We also look forward to the day when taking out the trash doesn't require snow boots, gloves, and earmuffs.